The happiness and the sadness. In a forest where tall palms trail brown skirts of discarded leaves and hornbills break the atmosphere above the canopy with a rush of air like a giant shaking sheets of cardboard, we walked to find the monkeys with feet as light as possible and muscles tense with expectation. The air was heavy and pressed damply on our skin as the cicadas swelled to fever pitch and dead wood crumbled underfoot with muffled groans, and the slightest incline left us gasping, but determined to continue. Pigs ran alongside us for a while, keeping us company in our domesticity as we walked towards the wild. The first monkey was black hair and pink skin retreating, taunting us with his unhurried, effortless stride as he melted back into the green. Then, as if to order and with a suddenness that stopped us in our tracks, we were outnumbered by curious faces, heads cocked to one side, contemplative stares as hands like ours in miniature scratched at characteristically hunched backs. Minutes became hours as we forgot the heat and the sting of insects, and the sweat dripping down our backs and into our eyes felt like nothing at all. As we followed our family through their home, it felt like our home too. We stood in the shade as they basked in the sun, stretching skinny arms toward the sky and inspecting themselves and each other with concentration so familiar and so endearing. We laughed as quietly as possible as juveniles with their freshly-coiffed crests descended from straight-backed trees with all four limbs wrapped around the trunk and bent willowy branches almost to breaking under the weight of their play, and looked at each other in wide-eyed delight as white-faced babies took shaky steps and tried to join in. The occasional glance, the heads tilted up to us and eyebrows raised in question let us know they knew we were there, but also that it was okay. Our hearts lifted and we forgot how to breathe in our excitement, and we didn’t expect to leave the forest carrying a sadness sharp and shiny in its newness. She appeared from nowhere, normal at first but with an approaching sense of something amiss. Pale legs, pathetically small, trailed underneath her in the leaves and mud, and her companion grimaced at us in warning. She stopped a few metres away, grooming her baby with the last tragic vestiges of hope as we looked at each other with sinking hearts. The group moved on and she followed; we gathered ourselves and continued with them. In a break in the canopy, they played and groomed, noisily reinforcing their bonds as they tumbled and stretched in shafts of light. In the shade, back turned and with only her baby for company, she was the loneliest figure in the world. She bowed her head, motionless in poignant reflection of the tiny body in her arms. Silence settled around her as the minutes passed and the chatter of her family broke her stare for only the briefest of moments. Another female approached, wearing the lines of age on her face as she sat down and quietly started grooming. A young male, harmlessly curious, reached out to touch the baby. Her silent scream shocked him into stillness as her hand on his wrist warned him away. He sat and looked, head bowed like hers, moving gently to grasp a handful of her hair as he started to understand. We sat and looked, in tears because we understood too. 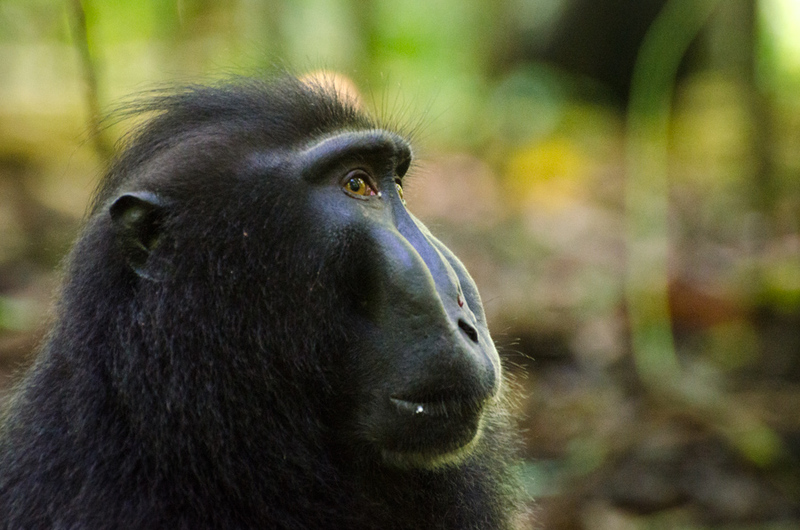 The monkeys in this story are Sulawesi crested black macaques (Macaca nigra), Critically Endangered primates endemic to North Sulawesi. I was able to see them thanks to my hosts at Selamatkan Yaki and the fantastic guides at Tangkoko Nature Reserve. ← Trees are not enemies, trees are friends. You certainly captured the moment with words…very moving. Reblogged this on Allison Hanes.